8.EE.6 - Slopes, Triangles & the coordinate plane - Use similar triangles to explain why the slope m is the same between any two distinct points on a non-vertical line in the coordinate plane; derive the equation y = mx for a line through the origin and the equation y = mx + b for a line intercepting the vertical axis at b. The first part of the standard talks about triangles and lining them up. 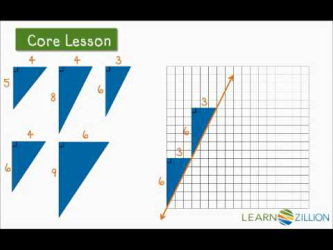 If you are able to "line up" the triangles, connecting them, you will make a line using their hypotenuses. The second part of the standard talks about forming an equation that has a consistent rate of change, the slope, and a definite starting point, called the y-intercept. The formula can be used to create a graph or find the points on a table. You can "build" a line by using similar right triangles. The hypotenuses, the longest side across from the right angle, can be "linked" together to form a line. And you will notice the slope of the line is a ratio of the legs of the triangles - rise over run. This is a fun interactive game that allows you to work on checking the slope of a line and understanding the equation of a line.